WASHINGTON — Atty. 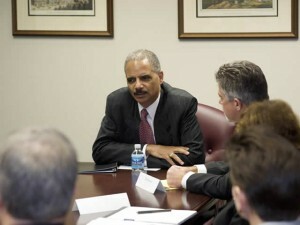 General Eric Holder has appointed nine new U.S. Attorneys to serve two-year terms on the Attorney General’s Advisory Committee of U.S. Attorneys. The committee, created in 1973, will report to Holder through the deputy Attorney General. The panel speaks on behalf of the U.S. Attorneys and provides input on policy and operational issues that impact U.S. Attorneys around the country, according to the Attorney General’s Office. The new attorneys, according to a press release issued Monday include: U.S. Attorney for the Southern District of New York Preet Bharara; U.S. Attorney for the District of Arizona Dennis Burke; U.S. Attorney for the Western District of Washington Jenny Durkan; U.S. Attorney for the District of New Jersey Paul J. Fishman; U.S. Attorney for the Northern District of Illinois Patrick J. Fitzgerald; U.S. Attorney for the Eastern District of Virginia Neil H. MacBride; U.S. Attorney for the District of Rhode Island Peter F. Neronha; U.S. Attorney for the Northern District of Alabama Joyce White Vance; and Acting U.S. Attorney, ex officio, for the District of Columbia Channing D. Phillips. The Attorney General’s Office said John S. Davis, Criminal Chief for the U.S. Attorney’s Office in Alexandria, Va., was appointed to the committee to represent Assistant U.S. Attorneys. “This is a critical and exciting time for the Department of Justice and I will rely heavily on these U.S. Attorneys as we work to further the Department’s efforts to reduce violent crime and gang violence, promote civil rights, ensure fairness in the marketplace and above all, preserve our national security,” Holder said in a statement. Posted: 10/27/09 at 8:51 AM under Milestone, News Story.